Locomotive #71 fire (Photo credit: Chicago Fire Department Chicago Fire Media). Chicago firefighters responded to a Still and Box Alarm about 4:04 p.m. Wednesday to a report of locomotive fire in a train yard near Roosevelt Road and Canal Street. 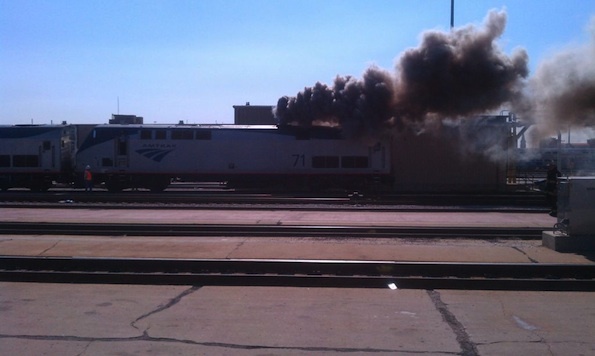 A fire started in the locomotive engine after a mechanical problem occurred with Amtrak locomotive No. 71. Two Amtrak workers who were transported to area hospitals to be evaluated for smoke inhalation. Smoke was seen coming from the exhaust vent of the malfunctioning engine in the rail yard before it was extinguished about 4:30 p.m.
Video of Amtrak locomotive fire from high rise nearby. Second Video of Amtrak locomotive fire from high rise nearby. 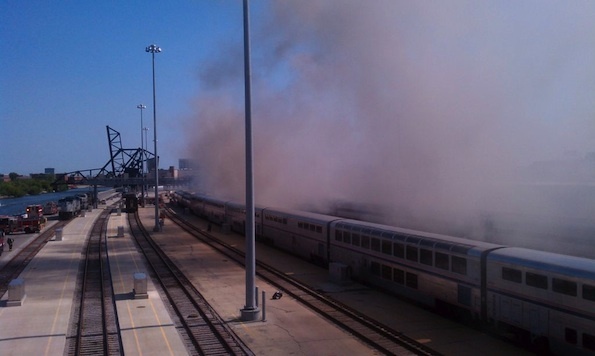 Locomotive fire (Photo credit: Chicago Fire Department Chicago Fire Media).